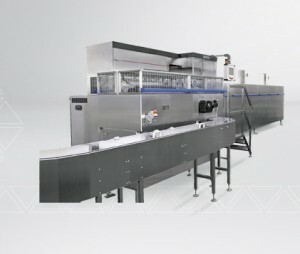 The ovens of the CAIMAN and CAIMAN-D series are designed for the fully automatic industrial production of rolled wafer cones with a sugar content of about 35 – 55% of the flour content (sugar cones). Capacities of up to 19600 cones/h are possible. Furthermore, the CAIMAN technology is the basis for wafer rolls and special wafer products like fan wafers and wafer cups.